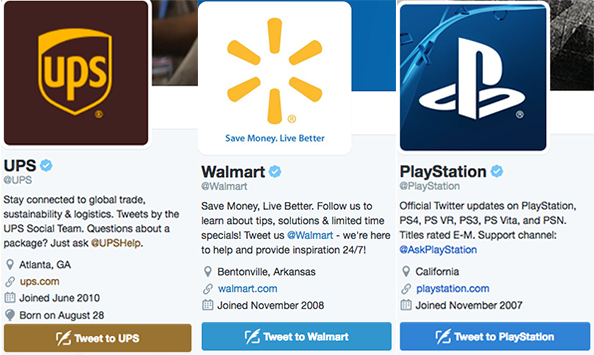 As competitors strengthen their online profiles, a need to differentiate your brand’s identity on social media grows. Building a recognizable brand known for its positive qualities should help gain and retain followers. Successfully executing branding strategies can help win customers, too. For those who’ve built a respectable social media following, many strategists consider influencer marketing a next step in building brand recognition. By getting an influencer who closely aligns with your target image to promote your accounts, audiences should associate your brand more closely with that target image. For example, many consumers associate Under Armour with athletic strife and excellence because Steph Curry is its biggest spokesperson. Though your brand may not be able to contract an NBA superstar, there are almost certainly influencers in your industry who can deliver branding benefits. The first step in executing an influencer marketing campaign is identifying suitable influencers. Of course, they must have large audiences. But those audiences must be engaged. Some studies show the average engagement rate on Twitter is between 1 and 2%, so anything higher is suitable for an influencer. The next step is building a relationship with an influencer who matches your criteria. You can start by following target influencers on their main social channels, interacting with their updates and sharing their content. Once you’ve built some rapport, pitch a campaign that builds your brand’s image while benefitting the influencer. The next section covers an example of how to do so. Getting an influencer to run your social channels for a day entices their fans to follow you, while giving him or her another avenue to showcase wit and knowledge. What’s more, the takeover helped MLB build a reputation on social media that many sports organizations aim to achieve: being funny and relaxed. The core of brand building on social media largely involves creating themes — or, messages — and regularly demonstrating them through text and visuals. Whereas influencer marketing campaigns may be best executed once you’ve grown a sizeable following, consistent messaging should begin when you join a social channel. It may take trial and error to see which kinds of content best resonate with target audiences. But once you’ve figured that out, being consistent in your messaging should reinforce your brand image. Your social profiles should encapsulate your business and its main messages, acting as a pitch for those who visit. Summarize the benefits of using your products or services in your profile description, including applicable keywords to make your account easier to find for audience members. You should also provide another method of contact for serious business inquiries. Depending on the platform, you can also alter your background, profile picture and theme colours to reflect your logo and match your website. By doing so, consumers will begin to recognize your brand assets. Establishing a common posting tone makes your updates distinct and easily-recognizable. This can also help build a connection with your target audiences, especially if your voice is in tune with them. Take IHOP as an example. On Twitter, the pancake house appeals to its young demographic by piggybacking off popular phrases among teens and writing without punctuation — similar to what you’d see in instant messaging. If you’re unfamiliar with relevant phrases or jargon, monitor your main social channels more closely. You’ll likely identify niche terms you can use to develop your voice. On a surface level, using a distinct voice increases IHOP’s engagement. Deeper, it encourages followers to associate IHOP with a laid-back dining atmosphere. You must be consistent with your voice — and the topics you post about — to build an authentic connection with your target audience, influencing them to keep your brand top of mind. Otherwise, that voice you’ve worked hard to create may seem forced and disingenuous. Deviating from core topics can also compromise brand tone and messaging. 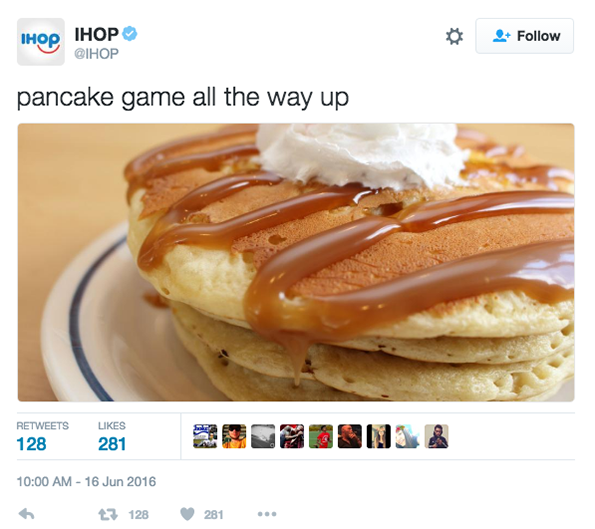 Going back to IHOP as an example, its social media strategists don’t post about government food sanctions. Doing so could damage how the audience perceives the restaurant. Stick to your voice and main topics to enforce your brand’s image. Since social media branding centres on influencing your audience to easily recognize and remember you, irregular posting damages your efforts by keeping you off user newsfeeds. For example, you may realize that tweeting in the morning earns more replies than doing so in the evening. You could also earn more engagement by posting twice a week instead of five times to a given platform. This will take some experimentation to determine. However, an optimal posting schedule helps keep user attention while potentially earning more followers. Images can be powerful tools to encapsulate your brand’s identity and messages, instead of seemingly-random pictures with your logo tacked on. It shows Red Bull’s connection to extreme stunts and appeals to its high-energy audience. As well as engaging fans, visual content of this quality builds and solidifies brand identity. Frequently engaging fans, followers and other audience members allows you to constantly communicate and demonstrate your brand’s core values. You can engage audiences by sharing original and third-party party content that ties into brand messages, or running contests and social events related to them. For B2C brands, replying to users also exemplifies favourable traits such as friendliness and helpfulness, especially when answering questions and helping solve issues. As a bonus, regular engagement helps keep your brand at the top of consumer minds. This can potentially boost sales and other meaningful actions. Like posting testimonials on your website, sharing user-generated content that positively depicts your brand can strengthen its identity. Consider that more than 90% of consumers trust earned media — characterized as word-of-mouth from impartial sources — more than all other types of advertising, according to a 2012 report from Nielsen. 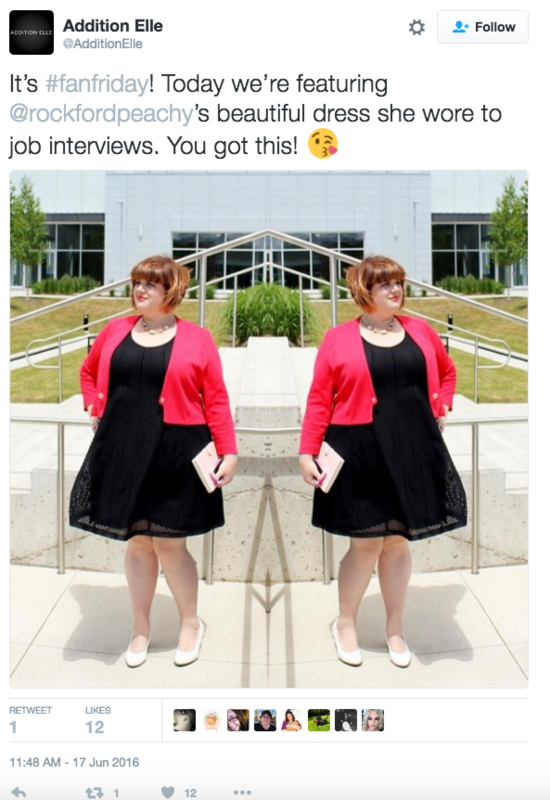 Take a plus-size clothing company for example. Posting customer images of stylish apparel fitting well would reinforce brand identity as a go-to option for the target market. Addition Elle uses this engagement and branding tactic. 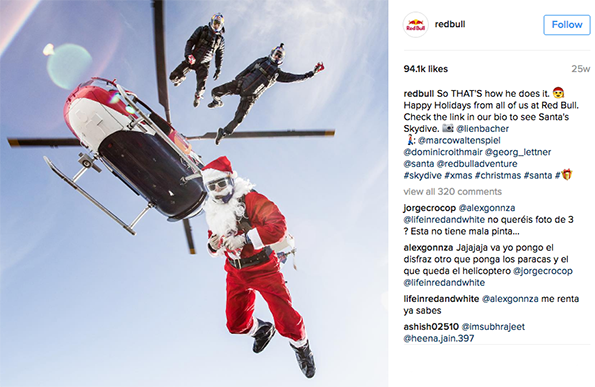 To reap the benefits of word-of-mouth on social media, share similar user-generated content. Creating, or participating in, groups and communities helps overcome many networks’ low organic engagement rates. This helps generate buzz around your brand’s content. You can reach users who are interested in your industry or offerings, avoiding crowded timelines that constantly update and bury your posts. For instance, an analytics company may create, moderate and promote a group about data mining. Not only does this give the company another method of engaging target audiences, but it furthers branding efforts. That’s because, in the eyes of group members, the company aligns itself with images of research and analysis. Similar to groups and communities, Twitter chats let you directly engage members of your target market to create buzz around your brand’s ideas, opinions and content. Use a chat’s hashtag to interact with industry players — ranging from prospects to other businesses. You’ll likely build your follower count as you answer questions and interact with fellow participants. This type of direct conversation and engagement allows you to demonstrate expertise and helps build brand reputation among active industry voices. You may waste time and resources attempting to engage audiences on each major social network, as your target audiences may not be active on all of them. LinkedIn may not be ideal for brands that target teens and young adults, whereas Snapchat likely won’t yield noticeable results for B2B companies. That’s why committing to a group of social platforms — slowly expanding it when appropriate — can help focus your engagement and branding tactics. As your profiles act as engagement and branding hubs, it’s worthwhile to promote your accounts outside of social media to grow their followings. Participating in Industry Events: Run a booth to promote your products. Create valuable physical content to distribute. Strike up a conversation with attendees. As more people learn about your brand, you should gain more attention on social media. Including Handles in Stores and on Products: For businesses who drive sales through physical locations, posting images of social networks lets customers know on which platforms you’re active. By drawing offline attention to your social media profiles, your online branding tactics are likely to reach more users. The bulk of users solely expect to receive status updates, albeit ones with original content, as they follow your social accounts. But offering perks can work to strengthen brand image. For example, send a private message to new followers that contains a free coupon. It can use your brand slogan, colours and general information, encouraging them to visit your store or website. They’ll be exposed to more branding tactics — whether physical or online — as a result. Perhaps most importantly, giving customers more than what they expect influences them to link your brand to a positive experience. 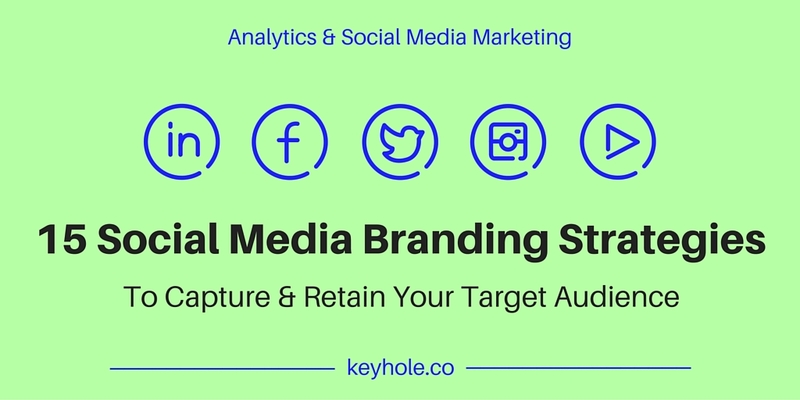 As with any marketing activity, you must regularly analyze your social media branding efforts to ensure to your tactics are working. Otherwise, you lack insight into your performance. The worst case scenario? You devote countless hours and a sizeable part of your budget to strategies that don’t yield desirable results. The best case scenario? Your strategies effectively establish a brand identity, yet you ignore data that can help further establish this identity at a faster rate. These two scenarios depict why ongoing analysis is crucial to successful branding on social media. Enacting a social media monitoring strategy helps ensure you don’t miss opportunities to build brand identity. For example, as consumers may forget to tag you or misspell your handle, you can monitor company-related keywords to pick up on their posts and strike up a conversation. 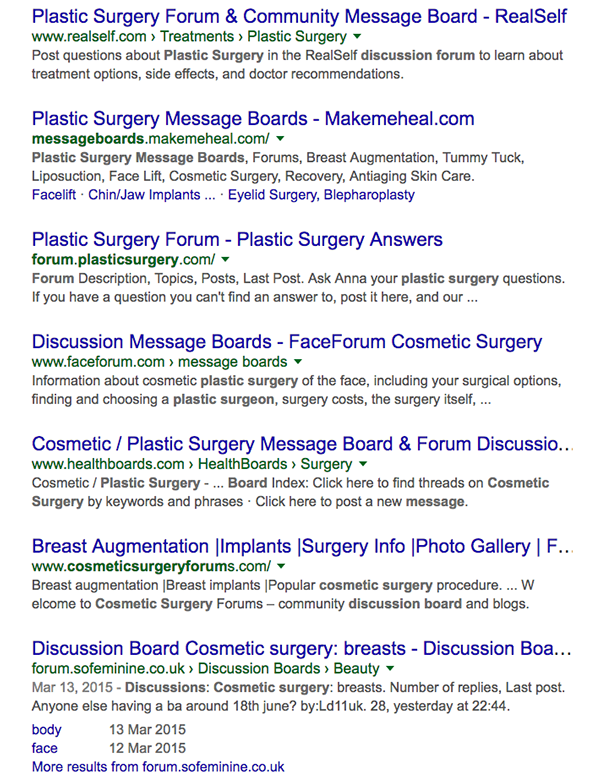 Tracking industry keywords can also uncover engagement opportunities and openings to discuss your business. This Twitter live-stream sample is from a Keyhole real-time tracker. This is beneficial for both branding and public relations because it opens doors to resolve issues and answer questions, exemplifying your business’s positive characteristics. Finding these opportunities should accelerate your social media brand-building efforts. Measuring social statistics such as reach and engagement can help refine aspects of your branding strategy. Assume that using specific hashtags is a key part of promoting your initiatives and products. However, you discover that few users search for — and view posts containing — these hashtags. Likewise, checking ad performance statistics may reveal they’re not reaching target audiences. This image is from a Keyhole real-time hashtag and keyword tracker. Word of your brand may not be spreading quickly enough as a result. By measuring these social tactics either manually or with a tool, you can determine if it’s worthwhile to alter your strategies to build brand recognition among prospects more effectively. It’s important for digital marketers to ensure their activities — ranging from influencer campaigns to active social media monitoring — help establish a clear brand identity. 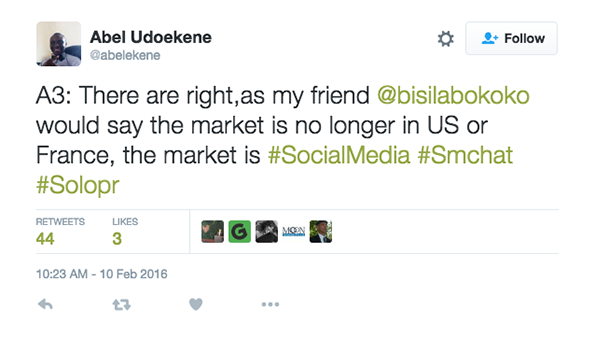 This means you shouldn’t post for the sole intention of getting shares and winning followers. Instead, think about how your actions can support brand goals and perception. The shares and followers will come as you work to build a unique reputation that resonates with your target audience. Bravo Marcus ! Finally an article that does not just re hash old , tired crapoola ! This reminds me of the “Power Brainstorming” Sessions we would have in the Entertainment Distribution Company I was a Partner in. Thanks for bringing up about one’s “Voice” a lot of people do not understand how important a function that “Voice” is . It will solidify your Primary market, but also can keep you standing out for your Secondary and Tertiary Markets. This article will be going out to my “Weekly RoundUp” Subscribers…I feel it is that good ! Thanks for your kind words, including me in your roundup and for your comments about voice. I totally agree — maintaining a specific voice plays an important role in winning your target markets. Plus, frequently changing your voice can confuse audience members.